Yeah, we went to BU. Yeah, we used to live down the street. But we don’t really care for the BU Pub that much. Sure, it looks like Hogwarts from the outside, and the beers are multiple, interesting, and relatively cheap. But when we drink, we try to get away from BU students. However, seeing as Andi still (occasionally) attends class at BU and it’s difficult to get through a day as an English major without drinking, we spend a fair amount of time here. So why not review the nachos? 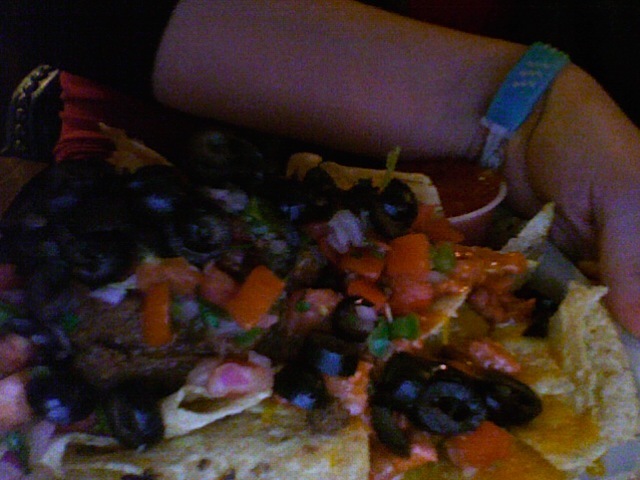 We ordered them with BBQ chicken, refried beans, pico de gallo and black olives (!). Presentation: Moderately attractive (which is more than you can say about most BU men). Salsa and sour cream on the side in ramekins (7). Quality of Toppings: Standard tortilla chips, and decent cheddar cheese. The black olives, which aroused much excitement, were oddly tasteless. Pico de gallo came straight from the BU dining hall (not that there is anything wrong with that; we love Towers burritos as much as anyone). Salsa and refried beans were straight from a can, nothing to write home about. It was difficult to tell the chicken from the tomatoes, as they were the same color. The BBQ chicken was not the best choice as it did not coalesce pleasantly with the rest of the dish; and yes, while it was our fault that we ordered them this way, we don’t think that anyone would find this delicious, and question the judgement of the BU Pub keeping this option on the menu. (In addition, Andi wishes to mention that she has eaten the nachos here with chili and they were not tasty at all). (4). Distribution of Toppings: There weren’t enough chips to properly judge distribution. Based on plate size, everything worked out well. That said, it took Andi the better part of five minutes to find a piece of chicken (perhaps that’s why the tomatoes tasted so strange, though???). The cheese seemed to have entirely missed the memo about sticking to the chips, instead congealing on the plate. For the most part, everything was just piled on the top. While this was aesthetically pleasing, a more thoughtful distribution would have been much tastier (5). Price: $7.61 altogether? Not too bad. (In addition, they are only $5 on Friday nights during Red Sox games) (7). Overall: 23/40. Not very good at all. We’ll be back, but we won’t be ordering any more nachos here. Once again, BU proves to be mediocre. But at least this didn’t cost us $160,000.